Well, not my mom’s. I’m guessing Melissa Murphy’s mom’s, since it’s in her new cookbook The Sweet Melissa Baking Book. You know, I really don’t like bananas in their raw form (not even in smoothies), but once they are baked into something sweet, it’s a whole ‘nother story. R does like to have bananas in his cereal, but sometimes he buys more than he can eat. When that happens, I wrap them up and stash them in the freezer…after I’ve accumulated a few, it’s time for banana bread, cake or muffins! 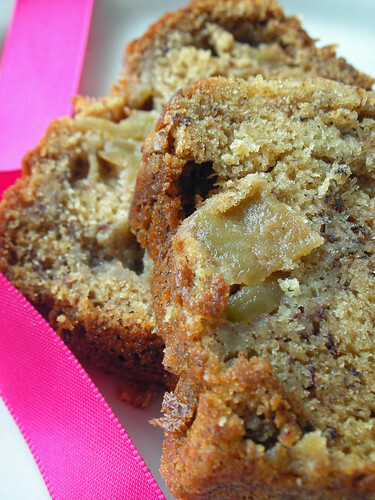 What makes this particular banana bread extra-special are the bits of caramelized apple throughout. Most banana bread has a pretty good shelf life and can even get better after a day of so. This one is no exception, as the sweet apples just meld more into the spiced bread. I was so happy with this, that I’m entering it into Sydneysider Not Quite Nigella’s Banana Bread Bakeoff event. If you have a favorite banana bread recipe, go check out her bakeoff, too. -In a medium bowl, whisk together the flour, baking soda, cinnamon, cloves, nutmeg, and salt. -In the bowl of an electric mixer fitted with the paddle attachment, cream the butter and sugar until light and fluffy, 1 to 2 minutes. Add the eggs, one at a time, mixing well after each addition. Scrape down the sides of the bowl. -In a small bowl, combine the orange juice and vanilla. -Add the flour mixture to the butter mixture in three batches, alternating with the orange juice mixture, mixing well after each addition. Scrape down the sides of the bowl after each flour addition. Stir in the mashed bananas until combined. Then stir in the reserved apples. -Pour the batter into the prepared loaf pan. Bake for 55 to 60 minutes, or until a wooden skewer inserted into the center comes out clean. Remove to a wire rack to cool for 20 minutes before unmolding onto the rack to cool further. This looks amazing! Apples and bananas sound like a wonderful combination and I love how moist this bread looks. I definitely want to make this soon! PS. did you get my email reply? Oooh, the apples sound so wonderful in this!! What a great entry! It looks so moist… YUM! OMG! This is so awesome! We couldn’t even wait long enough to let it cool. Dangerous stuff!!! Wow I just made this today, after receiving The Sweet Melissa Baking Book this week. This recipe really caught my eye with the added caramely apples. 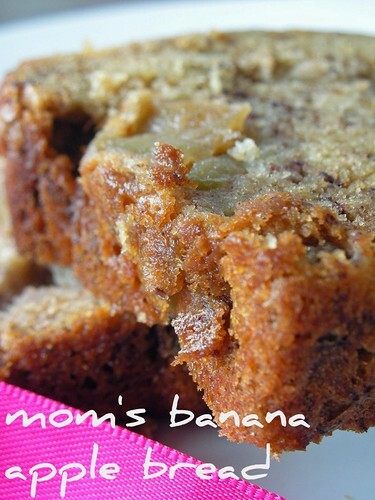 Your banana bread looks absolutely delish! I must be hungry because I am reading through your blog and trying really hard not to lick my computer screen. I found your site after drooling over all the entries in the Not Quite Nigella roundup. I may try lightening this with some applesauce in place of the butter. I’ll let you know how it turns out. Yours looks great! sharon–That’s a great idea! Do let me know if it works out! This looks incredible! You should enter it into another contest!! The winner gets a $50 gift card to Sur La Table (plus more links coming back to your site). I baked this in my 1.5Qt loaf pan today and it completely overflowed and made a mess in the oven! Not sure why that happened. Other than that, it was quite tasty. Polina–That’s so weird! I’m sorry that happened to you. Two other bloggers have made this using the recipe from this post, and their breads came out fine. That’s the best idea I have heard for making apple quick bread–caramelizing the apples. No mushiness! I’ve been meaning to get that cookbook. Delicious! OOOHHH.. just made this and it looks absolutely wonderful! It is waiting on the cooling rack and i cannot wait to try it. PS i got the link from the banana bread contest from Not Quite nigella! Made this today- it was too large for my 1.5 qt loaf pan (has sloped sides). didn’t overflow but looked close to it. smells great though, haven’t tried it yet. Just made it but I added more fruit such as blueberries, raisins and raspberries and made a topping with banana, oats, brown sugar, granola and almonds. It’s so thick and moist! I didn’t peel the apples though; I need the fiber. It’s worth the wait-enjoy! This looks delicious! How many calories does this cake have? I have no idea, Margaret, but it does contain a stick of butter. Totally just made this. I might just die. Of happiness. Holy Perfect Bread Batman….Just made this fabulous recipe, turned out perfect, but I used smaller pans 3 x 8 and baked for 30 minutes…PERFECTION! I will never bake boring banana bread again. I made this last night and OH MY GOD it is amazing!!!!!! I used 3 large bananas though to up the flavor and made it in a spring form pan instead of a loaf pan — took about 75 minutes for mine to bake. I tasted the batter (licked the spoon! guilty!) and was afraid it would be too clove-y because the batter tasted a little strong but the flavor mellowed in the oven and it was PERFECT. I sprinkled a little brown sugar on top before baking and that gave the top crust a little something special. It finished at 11pm last night and 12 hours later there is only a small wedge left. It was a huge hit. Tara– This is a good one! Glad it was a hit! oh also i chopped the bananas roughly instead of mashing, I like banana chunks in mine. Texture on this is great. Head and shoulders above any other banana bread I’ve ever made. Thank you for the recipe! thank you for the recipe, it made the best Banana cake I’ve ever made, I didn’t use the apple this time will try it next time. this is the best recipe ever!! i just finished making 2 batches and they are divine!!!! i left the apples this time, but it still turned out so so good!! found your link from NQN. this is now my go to banana bread recipe. I have worked this recipe to change it to sugar free and it works. Change the brown sugar to br sugar splenda and cut the sugar from 1C to 2/3C Splenda. I also add a little extra soda and some dry milk powder (like the splenda bag says). It is my most popular recipe, everyone asks for it. I usually make 4x the recipe at a time ending up with 8 loaves -using the metal pans from the dollar store. They freeze beautifully. I made this recipe using whole wheat flour, substituted applesauce for half the butter and only used 2/3 cup sugar and it still turned out DELICIOUS!!! thanks so much for this great recipe. This was wonderful! Thank you for posting this recipe! Thanks for trying it out, and for the comment! Glad you enjoyed! I baked this banana bread for a teachers assistant appreciation morning tea. All I can say is YUMMY!!! This is such an easy recipe. Not a crumb left on the plate!!! This recipe is a keeper!it is so moist and I had no problems with it. Thank you so much for sharing this recipe. Thanks for sharing the recipe.. Will definitely try it!!! I have made this & it is absolutely delicious & very moist. Even better the next day when it is firmer…if you can wait that long! Thanks for commenting, Pam. Glad you liked it and good to know whole wheat works in this. Hi N! You’re right–sorry about that. Should be 1/2 tsp vanilla in the apples. I’ll adjust that in the recipe. Thanks for pointing it out, and hope you make the bread! This is the best banana bread. The apples make it so moist. Thank you for sharing!! I just made your Mom’s banana apple bread. This is the best tasting ever!! Definitely going to make it again and again. My husband said that I can not share it with anyone but him. Lol. Enjoy. I came upon this today, its now in the oven. I was missing two ingredients, so in place of orange juice I had to use orange liquor and no ground cloves so I put in ground ginger… hopefully it will be as amazing as what you have made! I have made this bread for a few get togethers and it is always a hit. The Apples make the bread so moist and delicious. I love to make it for my family and friends. I’m so glad to hear that! It’s probably about time I make it again myself. This recipe is amazing! Thank you so much for sharing! Thanks for the comment! It’s about time I make it again myself!